Now that you have figured out who Ravi is, I can proceed to answer the next question about the reason to meet him. I was always eager to meet him because I think he is an inspiration not only for kids of his age but also for grown ups. He learnt so many languages without having any formal education till date. He took efforts to learn foreign languages through his interaction with tourists from different parts of the world. He can sell his product in French, Iranian, Arabic, Japanese and many other languages. He is a perfect example of value addition. He sells hand fans made out of peacock feathers near Hanging Garden. He could have done that with his limited language skills. However, by taking efforts to learn foreign languages he did a big value addition to his business. By interacting with tourists in their own language he made an impression on them and thus his sales prospects increased. I wanted to meet him in person someday and I am very glad that I got to meet him today. This meeting was made possible all thanks to Gayatri, my friend. She is doing MBA and one fine day she happened to go to Hanging Garden at Malabar hill along with her classmates. She had read my previous blog and was aware about Ravi. She saw him near Hanging Garden (also know as Sir Ferozshah Mehta garden) and informed me about it. Since then I was thinking that I should meet him. Today I along with Gayatri went to Hanging Garden to meet him. We roamed around in the garden for a while but could not locate him. Then we stepped out of the garden and saw him sitting on the opposite side of the road with the peacock feather fans. We went to him and I told him that I wanted to buy the fan. Then I addressed him by his name (Ravi). There was no surprise whatsoever on his face. I asked him to tell how I could have figured out his name. His answer was that I must have figured it out from the internet. He is aware of his presence in the internet. From the conversation I realized that he still doesn’t go to school. He stays in Santacruz and has been coming to Hanging Garden since the age of 5 to sell stuff. He learnt everything at Hanging Garden. This garden has been both his workplace and school. I told him that he should go to school. He said that many have told him to and that he is planning to go to night school. I bought a peacock feather fan from him which will serve as a memento. I hope and pray that Ravi does go to school because if he does he will make it big. I firmly believe that formal education combined with the confidence he has gained through his experience in sales would make him a great success story; an inspirational story for everyone to make note of. 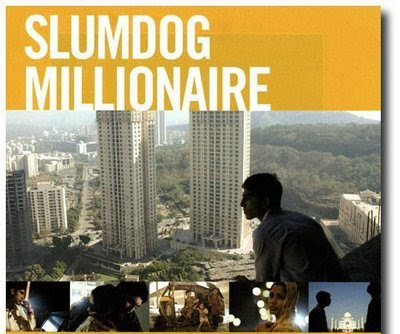 Today I watched Slum Dog Millionaire, the movie that has been making news all over the world. It has already won four awards at the Golden Globe and has bagged 10 Oscar nominations too. Now when this movie has started getting great reviews, certain people in India have started to raise objection against the movie. 1) The very title of the movie is found to be offensive by a self proclaimed slum leader. 2) A Hindu organization feels that in the movie Lord Ram has been insulted. 3) The movie has portrayed India in bad light. This post of mine is an effort from my side to analyze these objections from my perspective. The first objection is about the term Slum Dog. I know equating a human to the dog is demeaning. However, we fail to remember that this is a movie made by an Englishman. In English there is a phrase “dog’s life” which means to lead a miserably unhappy existence. So, the movie is about a boy who leads a miserable life in the slums and ends up being a millionaire. Instead of being thrilled and exited about a movie that gives hope to the people living in the slums, some people are having a myopic attitude towards the name of the movie. I found the movie to be very nice. There were occasions when abusive language was used and cruel acts shown, yet one could stand it. This movie is a good blend of reality and fantasy. It showed the dark side of life yet managed to keep you optimistic about life. The next objection is about Lord Ram being insulted or depicted in poor light. Let me explain the scene in the movie due to which this objection is being raised. The protagonist of the movie is being asked a question in the movie as part of the game show that he is playing to become a millionaire. The question asked was that what is it that Lord Ram is typically shown holding in his right hand. While thinking about the answer to this question Jamal (the protagonist of the movie) gets into flashback mode and remembers a kid who poses as Lord Ram in the slum he belonged to. The kid’s body is painted in blue; he is dressed like the Lord and is shown holding a bow and arrow in his right hand. Anybody who stays in Mumbai must have observed such kids doing the rounds begging on the streets or at railway stations. The organization that seems to be offended by the movie has no issues when our beloved and respected God gets insulted day in and day out. I do not understand why God who is the Supreme Protector of everything in the universe needs to be protected by people. The most prominent of objections has been that this movie has portrayed India in bad light. Slums in India are a reality. They exist along side the concrete jungle. They lead a dog’s life literally. I do not feel that we should feel offended when a movie maker decides to capture it in his camera and showcase it to the world. If we cannot stand it, instead of questioning the movie we should be thinking about ways to eradicate the slums. We need to figure out ways to ensure that slums do not come into existence. I found all three objections to be baseless. Maybe by the time I post this blog some new objection might have been raised. With recession worries affecting us, why can’t we enjoy a movie that feeds us with optimism? Why can’t we look at the broader picture?